President Donald Trump has an ally in Guatemalan President Jimmy Morales, but you wouldn’t know it by the actions of the US ambassador. Luis Arreaga went rogue this Tuesday and gave legitimacy to an event hosted by an anti-American, UN-backed commission. Arreaga was at the “Comparative Experiences in Combating Corruption and Impunity” event of the Anti-Impunity Commission (CICIG). This contradicted the Trump administration and indicated State Department opposition to Morales. Such support is harmful because the globalist CICIG has outstayed its welcome and wandered far from its legal mandate. The CICIG is flagrantly partisan and set to steal the Guatemalan 2019 presidential election. The CICIG has illegally contracted to monitor the election and campaigns—not that this has anything to do with its mandate—and is using this status to intimidate would-be donors to parties that could defy globalist and deep-state meddling. Created in 2006 to identify and dismantle clandestine security apparatuses, the CICIG was supposed to merely assist the Justice Ministry. However, a recent report by four civic organizations examines its history, actions, and inactions and concludes the CICIG is itself a source of corruption and criminality. It is what it was created to eliminate. In April, for example, the Helsinki Commission of the US federal government discovered CICIG collusion with Russia in the prosecution of the Russian Bitkov family fleeing persecution from Vladimir Putin. Congressional hearings, the Wall Street Journal, and Judicial Watch all documented CICIG criminality and collectivist loyalties. In September, Morales notified the United Nations that Iván Velásquez was unacceptable as CICIG commissioner. The note said he would be denied reentry into Guatemala and requested a new commissioner. In violation of international law, Secretary General António Guterres hasn’t named one, presumably because a replacement could discover and publicize CICIG criminality. Such transparency and publicity would endanger the CICIG political agenda of stealing executive power for its allies. Now with an office right in Guatemala’s electoral authority, the CICIG is realizing its illegal arrangement. This means monitoring the financing of political parties and electoral advertising. Already, the CICIG’s presence has intimidated large private-sector organizations into not contributing. Contravening the Vienna Convention on Diplomatic Relations, CICIG continues with Velásquez as commissioner from outside Guatemala. The high court illegally ruled Velásquez can return. The UN-Morales standoff is about one thing: power. Velásquez has unsuccessfully tried to depose Morales and is now determined to get a CICIG-friendly successor in the presidency. Former US Ambassador to Guatemala Todd Robinson (2014-2017), now State Department senior advisor for Central America, abused power to place his allies on Guatemala’s highest court. Working together, strongwoman magistrate Gloria Porras and Velásquez execute a socialist agenda. Those who stand in their way can expect to be jailed without evidence nor due process. The CICIG forum on Tuesday featured Judge Erika Aifán on the panel about the role of the judiciary in the fight against corruption. Aifán is the epitome of a corrupt, hanging judge with a record of obvious violations of due process and law. Russians Igor Bitkov, his wife and daughter, were sentenced to unusually long prison terms regarding documents obtained from an international company that serves migrants. Two days before the Helsinki Commission was to hold a hearing about the case, the high court ruled there had been no crime and ordered the lower court to free the Bitkovs. CICIG advocates requested the hearing be canceled. The high-court ruling sought to avoid scrutiny of the CICIG. This ploy failed, and the hearing exposed CICIG criminality. Attorney Moisés Galindo represented defendants accused by the CICIG and is one of their political opponents. The CICIG accused Galindo of money laundering for receiving a vehicle as payment of legal fees. They arrested Galindo and illegally paraded him in front of the press. Aifán held him for 57 days before he got a hearing, which constitutionally must occur within 24 hours. A player in the CICIG strategy to dominate Guatemala, Aifán’s transgressions became known to the US Congress during the Bitkov hearings. 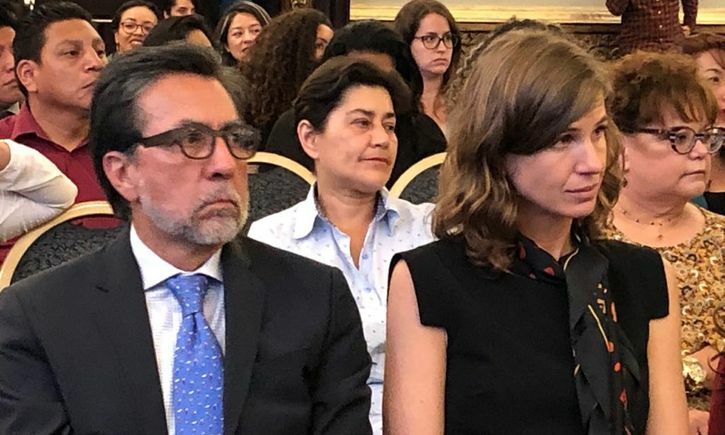 In addition to UN illegality regarding Velásquez, Arreaga’s presence at the CICIG forum is a State Department public endorsement of Aifán’s corruption. Without State Department actions, there would have been no CICIG and no coopted judiciary. Arreaga has a record of validating illegal court proceedings. In the Molina Theissen case, four military veterans were convicted of serious crimes with no evidence and in violation of the law. Yet Arreaga attended and praised the trial, as did senior State Department official David Mandell-Anthony, formerly of a George Soros organization. Arreaga’s predecessor, Robinson, favored Sandra Torres in 2015 for president. She failed then but is a leading candidate for 2019 and met with Robinson at the State Department in September. Her ascendancy to the presidency would guarantee an adversarial Guatemala towards the United States and increase the flow of illegal migrants and drugs. US power can contain adversaries, but why let that happen when Trump and Pompeo only need to control their own people to prevent it? They could obligate State Department globalists to support Morales and an immediate end to the CICIG. Socialists in Guatemala cannot win a free election. That is why they resort to stealing. Free elections would suffice to prevent Guatemala from being controlled by adversaries.